I have a profound interest and unnatural obsession when it comes to all things Dean Koontz. He’s just awesome. His mind is fabulous. Honestly, if I could trade minds with one person, for just one day… it would definitely be his. I recently finished reading ‘Icebound’ which was re-released and retitled after a previous novella written by the author, under the pen name of David Axton and initially titled ‘Prison of Ice’. It was reissued because he was inundated with thousands of requests to bring back into print some of his older works. ‘Prison of Ice’ however was in a much rougher form [apparently], and hence was revised by Koontz and updated according to newer technology and cultural references while still trying to maintain the entire plot line and original feel of the overall story. I enjoyed it tremendously as it was a refreshing change from his ‘normal’ work, but after reading the “Note to the reader” at the back – it was duly noted that this was because he had wanted to pay homage to a man he deemed as ‘the master of adventure-suspense’, Alistair MacLean, who penned The Guns of Navarone, Where Eagles Dare and Ice Station Zebra. ‘Icebound’ was written using the genre predominantly used by MacLean to see if he ‘could pull it off’. I would say he succeeded, as it was suspenseful and tense – definitely fast paced and contained heavily detailed information on a number of topics ranging from submarines, polar ice caps and communism. The also thorough portrayal of his characters, accompanied by their ‘indepth’ histories [which I believe is one of Dean’s best tools in immersing the reader into his believable characters and hence almost believing that such ‘devilish’ things could possibly exist]. You’ve got to love it. How profoundly true is that. A [candy] blast from the past! 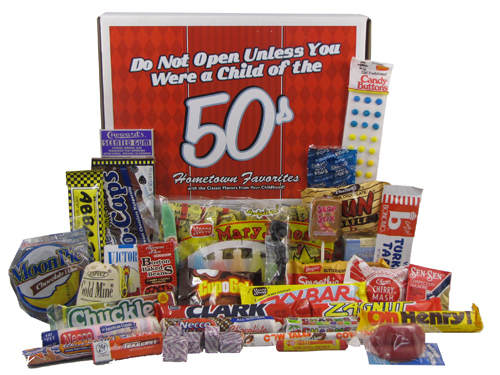 Ok, we all love sweets and candies, even if we claim not to – and secretly have a little unmarked box hidden in your ‘clutter’ cupboard, harbouring some candy stowaways. I was presented with somewhat of a challenge when I wanted to incorporate my ‘eccentric and unique’ tastes, with a splash of 50’s – but NOT in a way that was entirely cliched… so I had decided that I would throw this unique ’50’s hint’ into my guest gifts at the wedding. I firstly resorted to Google, then a local website and lastly a British website, who being the main distributor for sweets after which I sought…didn’t deliver to South Africa. I was annoyed. In this world which ‘techies’ and cyber-junkies refer to as a ‘global village’, due to the fact that the internet has made the world ‘a smaller place’… I was like, “…and you don’t deliver here, HELLO! Who doesn’t deliver here?”. Apparently them. Not being one to give up easily, I decided to persist in my search for ‘Love Hearts‘…. magically and purely by chance I stumbled onto the most incredible website ever, EVER! I nearly fell off my chair at the sheer awesomeness… the fact that I had never heard of such a marvel before, or seen it any of the few places listed as being advertised, was shocking! I found their prices to be reasonable [since this was a rare and almost extinct species…], plus, they delivered to South Africa! Considering the quantity needed had to be enough to suffice for over 100 guests, include the transport costs to get from there to here and with their exceptional, helpful and friendly service being an added bonus – The total sum paid was well worth it! Any persons 'fantasy-come-true' and it's REAL! I would use them again in a [love]heart beat.